Albuquerque is a big city, so it takes quite a while to get out of it. I was kidding about hammering, but we did start out at a pretty good clip behind Franz, who is a strong rider. Our group of four or five eventually caught up to another group of four or five as we fought the rush hour traffic through town. Thunderclouds were much in evidence, and at one point I could see where it was raining up ahead of us (in fact, it rained on Jay, who is one of our fastest riders). After 18 miles, we reached the town of Benalillo, where it had clearly just rained. I counted only one bike amongst our group that had fenders, so it was pretty messy and my lovely wool Swobo jersey got spotted with mud on the back. Shortly after this, I decided that I’d had enough of “hammering,” so Anurang and I dropped off the back of the paceline and settled into a more manageable speed: “sweet sixteen” as Anurang said. Unfortunately, the wind, which has been mostly from the south since I can remember, was now blowing from the north, so “sweet sixteen” soon became “slow thirteen.” But at least I could see something more than the rear tire of the guy in front of me. After a couple of miles, another paceline of a few riders caught up to us, so we followed them for a while. 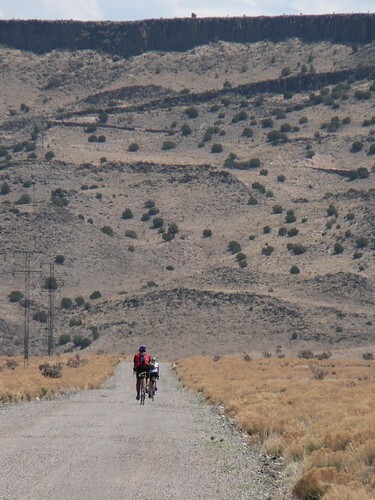 Scott Alperin, who was on the tour five years ago as far as Albuquerque, and who joined us today to ride as far as Amarillo, was pulling these guys. After resting at the back for a while, I went up to the front to give Scott a break for a couple of miles before we reached the first rest stop at Algondones. From here, we got on I-25 heading toward Santa Fe. Lon caught up to us on this stretch, so I rode with him for most of it. We stopped after passing an Indian casino in San Felipe to take a photo of “The Big Notch,” which was the way the old road used to come over the hill. 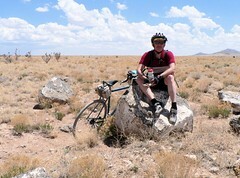 We were riding a series of very big rollers that gradually gained us some altitude. After 15 miles of the interstate, Lon and I climbed over a concrete barrier to get on a nice frontage road that took us the last couple of miles up to where the van was parked for the second rest stop. 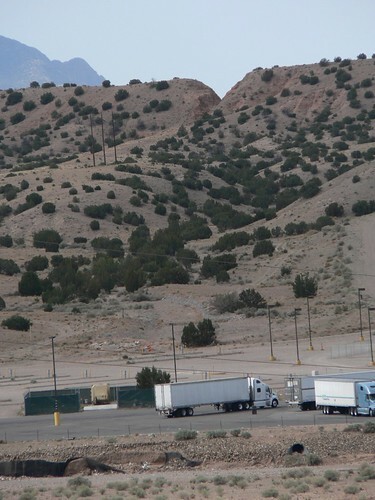 This was the last stop before La Bajada, so Lon warned everyone who was planning to do that option to make sure that they had enough food and water to last them several hours. Most of the fast guys we’d ridden with early in the morning had already left, but we (Lon, Anurang, Phil, and myself) waited around until all the riders had reached the rest stop, especially Susan, who Lon knew wanted to do La Bajada. A little bit about La Bajada: It supposedly means “the descent” in Spanish, although we would be climbing it. As a route, it’s centuries older than Route 66. In fact, Route 66 only went through Santa Fe before 1937, so La Bajada’s tenure as a Route 66 byway accounts for only a small portion of its history. It’s never been paved. Going up it now, it’s hard to imagine how Model T’s ever managed it, although I suppose it’s changed a lot since those days. It’s a volcanic escarpment so there are lots of big igneous rocks everywhere on the “road,” which is more like a steeply switchbacking hiking trail than a former highway. Lon, Anurang, Phil, Susan, Scott and I all started together. We broke up into three separate groups pretty quickly: Phil and I were at the front of the regular La Bajada route, Lon and Anurang decided to take an older route to the top that forked off after about a third of the climb, and Susan and Scott were a bit behind Phil and me. Lon always makes La Bajada sound like a highway to hell when he describes it to people, but it’s really not that bad if you’re willing to walk a few sections. I had to walk more sections than I recalled from five years previous, but I think I rode more than half of the climb, as did Phil. The views were stunning. Once you reached the top of the plateau, the riding became much easier: basically across a grassy plain with a two-track hard-packed (mostly) dirt road. Phil and I rode until we got to the point where I reckoned the route that Lon and Anurang were on rejoined ours and stopped there to eat and drink a bit while we waited for them and for the other two. They showed up in about 10 minutes, and Scott and Susan arrived not much later. Now we had about seven more miles across the plateau before a “steep gravel downhill” (I live for those – not), after which we met the SAG truck driven by Rosemary. I confess: I was getting tired at this point. Riding through all that sand and gravel takes a lot of spinning, and spinning isn’t one of my strong suits. But we still had 10 more miles of riding, some of which were uphill. Fortunately, the wind had now changed back to its normal southern self, so it wasn’t too long before we entered Santa Fe. After getting cleaned up, I had just enough time for a quick walk around the plaza and to upload some photos at a wireless-enabled café across the street before meeting my sister-in-law and her husband for a really nice dinner in town. The forecast for tomorrow is rain, and they could really use it here. My ideal would be for it to rain a lot – wherever we aren’t. We’ll see tomorrow, I guess, when we climb Glorietta Pass – the highest point on this trip.